A Clear Message From Colombian Police: Don't Mess With '100 Years Of Solitude' In 2015, a first edition copy of Gabriel García Márquez's classic was stolen from a Bogota book fair. Many cases in that city go unsolved, but local law enforcement went all out to find the book. 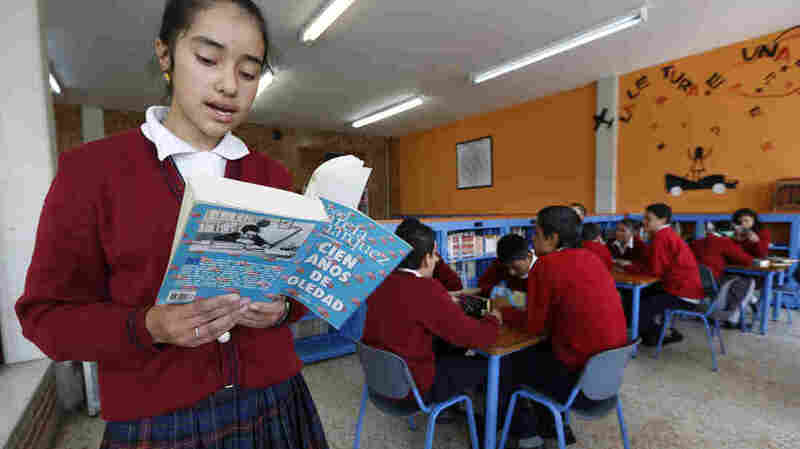 A student reads aloud from Gabriel García Márquez's One Hundred Years of Solitude, or Cien Años de Soledad, in Bogota, Colombia. This is the story of a stolen book, a sense of national pride and some creative sleuthing. The book in question is a first edition copy of One Hundred Years of Solitude by Gabriel García Márquez. In 2015, it was stolen from a Bogota, Colombia, book fair. Many cases in that city go unsolved because of a lack of resources, but local law enforcement went all out to solve this crime. In its new season, the Spanish-language podcast Radio Ambulante tells the story of how the book was recovered. Host Daniel Alarcón tells NPR's Kelly McEvers that the story left him with conflicting feelings. "On the one hand ... we love García Márquez, we love books, and so it's just something to celebrate," he says. "On the other hand, it leaves this kind of odd taste in your mouth because you're like, Well, if they can solve that crime in six days, why don't they solve other crimes?" This story was reported by my colleague Camila Segura, who is the senior editor of Radio Ambulante. She's a Colombian journalist, she lives in Bogota. ... And what happened was that they were celebrating García Márquez's life a year after he passed away. They always invite a country to be like, you know, a special guest at the book fair in Bogota, and that year they invited Macondo, which is the made-up [town] that García Márquez wrote about in so many novels. So as part of the exhibition about Macondo, they had a collection of first editions that were brought by a bookseller. And, you know, I have been to that book fair, Kelly, like thousands of people come through there. I was there that year, in fact, though I did not steal the book. ... And in the midst of all of that chaos, one day one of the booksellers that was in charge of looking over this collection of books saw, look at that, the window of this glass case is ajar and there's a book missing. And it was a first edition, signed, of One Hundred Years of Solitude. It's almost like two parts of Colombia colliding. You know, this view of Colombia that is for export — which is the Macondo, this vision of Latin America that García Márquez has written about — and then also this kind of very urban, dark theft; violence; crime. It's almost like two parts of Colombia colliding. You know, this view of Colombia that is for export — which is the Macondo, this vision of Latin America that García Márquez has written about — and then also this kind of very urban, dark theft; violence; crime. So these two competing visions collide in a place that was supposed to be a celebration of the former. And I think that's what made people so upset. It was kind of wild. ... We're talking about a country where crimes go unsolved, where murders go unsolved. And one of the things that Camila found as she was investigating this was that the police — and this is something I think that we all know intuitively — that the police sort of rank crimes as to their importance and that importance often has to do with who's breathing down their neck to solve it, and that often has to do with power, and that often has to do with media. And so the theft of this book went around the world ... and so there was a real need to solve it and solve it fast. It was found in a neighborhood near central Bogota. ... There were competing stories, but the story that we heard involved a shootout and involved people sort of running away into the neighborhood and disappearing. [They found] the book in a box just kind of on the street. ... They were being chased and it just dropped. ... So they've recovered the stolen property, but no one's been arrested for the crime itself. I'm interested in any story that complicates our vision of Latin America. ... You know, García Márquez is both an iconic figure and ... he's not quite as relevant as he used to be. Like, we're reading different books, we're discussing different things. The world that he described is not the world that exists anymore in Latin America. Latin America is much more urban than it was when García Márquez was telling his stories about Macondo, you know. The majority of Latin Americans live in cities now, they don't live in towns like Macondo. And so I was really interested in this clash ... between this vision of a folkloric Latin America as described in the work of García Márquez and this other Latin America, which is the one that I know better. ... And the fact that these two worlds collided in front of an audience of hundreds of thousands of millions of people who followed the news of this stolen book and its recovery was also super attractive to me as a storyteller.